William Walker’s First Year of Marriage by Matt Rudd is a book that I downloaded for free from Amazon for my Kindle. It sounded quite amusing, and as I didn’t pay anything I had nothing to lose. The book opens following William’s marriage to Isabel, the girl of his dreams. It is written not quite in diary style, but in first person and with daily updates. Williams recounts what has happened that day, and often goes off on other subjects which take his interest, and compiles some rather silly lists. We soon learn that he doesn’t like Isabel’s best friend Alex, who he suspects of trying to steal Isabel, and that he is terrified of his ex, Saskia, the Destroyer of Relationships. William is a nice guy who just wants to enjoy wedded bliss with Isabel, but of course things don’t always work out that way. He has a habit of making bad decisions, often based on the bad advice of his friends, and things go wrong even when he tries to do everything right. The story of William Walker’s First Year of Marriage is very straightforward, and quite predictable after a time, but the story is really there to hold everything together – the book is more about all the incidents and silliness which seems to come along during the year. William is a good lead character and narrator, and you really want everything to go his way, and for Alex and Saskia to just disappear and let him live his life happily and peacefully. He is very endearing, and his mishaps often elicit a giggle. While reading the book, I started to think that this was chick-lit in reverse – bloke-lit if you will. 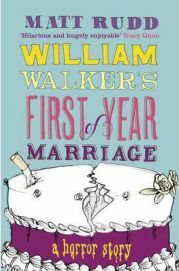 William Walker’s First Year of Marriage is a pleasant, enjoyable and easy read, as chick-lit should be but so often isn’t (pleasant that is, it’s always easy). The gently amusing incidents, the story of the marriage and the endearing lead character all smack of good quality chick-lit – but it’s being told by a man. I really enjoyed this alternative take on a well-known genre, and found William’s narration and life refreshing. Although there is the love story, I found I enjoyed reading about William’s general daftness more than some girls quest to find The One. While a book of this style could be as bad as most chick-lit tends to be, Matt Rudd has hit the nail on the head with his characters, story and style. William Walker’s First Year of Marriage is a thoroughly enjoyable read, not at all taxing and great to relax with. You’ll find yourself rooting for William and Isabel, hating Alex and Saskia, and despairing of his friends advice, as well as giggling at all his mishaps. This is an excellent book to download for free, but I would recommend it even when it has moved from the free list. No Comments on "William Walker’s First Year of Marriage"